My Father in law Nolan Button (Tanya's Father) passed away this last Sunday after complications after surgery to remove some cancer they found. 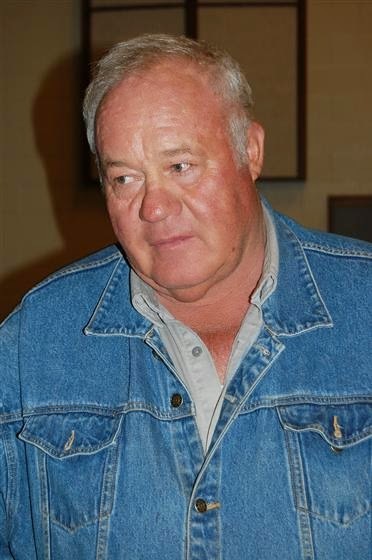 I had a complicated relationship with my Father in law he was a man use to toiling with his hands running heavy equipment from a small town (Kanab) in southern Utah and I was a city boy from the large city in the north (Salt Lake City). From the day I asked his permission to marry his oldest daughter to the last day I saw him (this last fathers day) walking around we never understood each other. We were from different planets or at least as close as we could be to that. I with my fancy computers and web development and his digging in the dirt with his equipment. But we did share one thing in common and that is that we both truly loved the same girl, my wife Tanya. 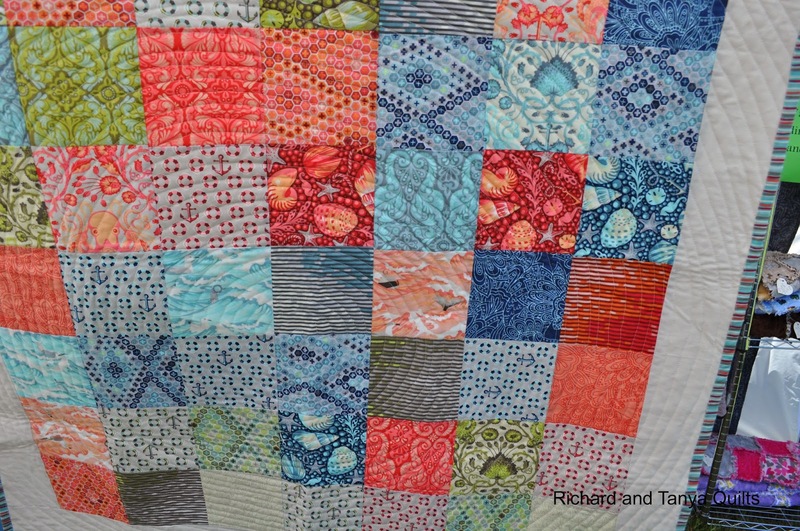 Richard has been attending a new guild called My Sister's 'N Stitches Quilt Guild. They do a block swap every other month. For this month they are trading Red, White, and Blue Bento Box Blocks. 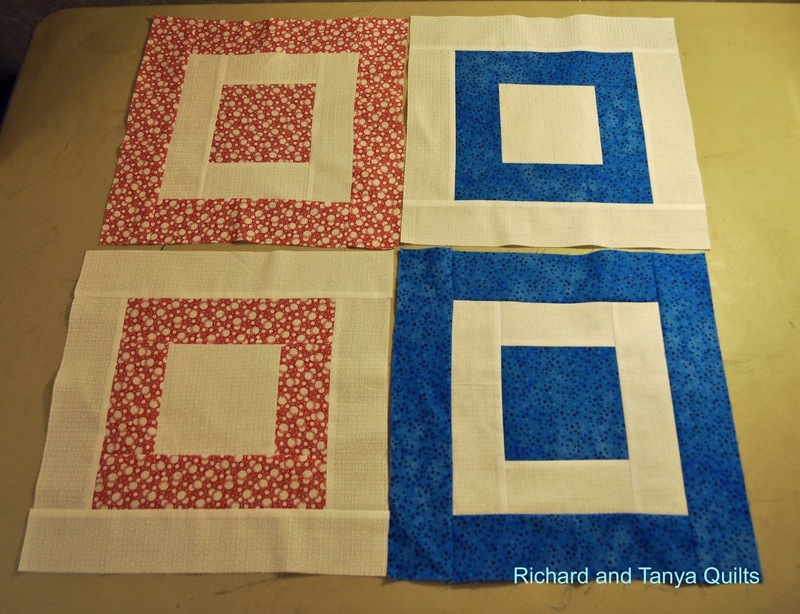 Here are some of the blocks he did. 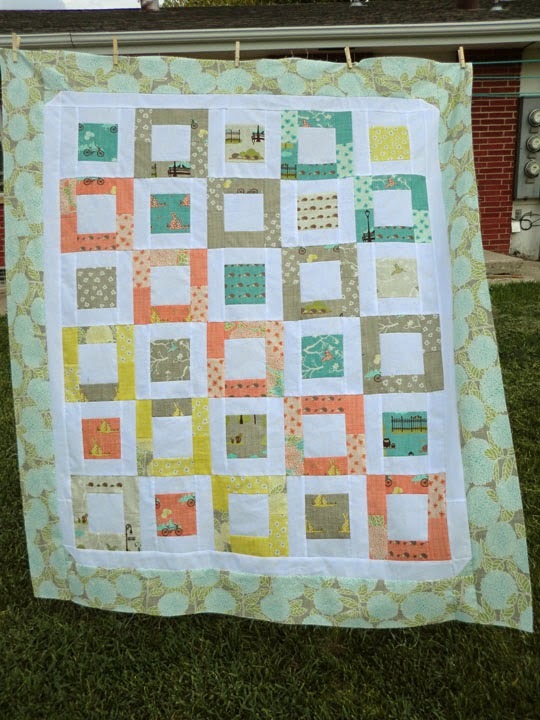 The finished blocks will be cut in quarters and 2 of the solid white sold blocks will be swamped with the white solid white blocks. They didn't want them cut, so here they are pre-cut. He did 16 blocks for the swap with 8 extras for home. 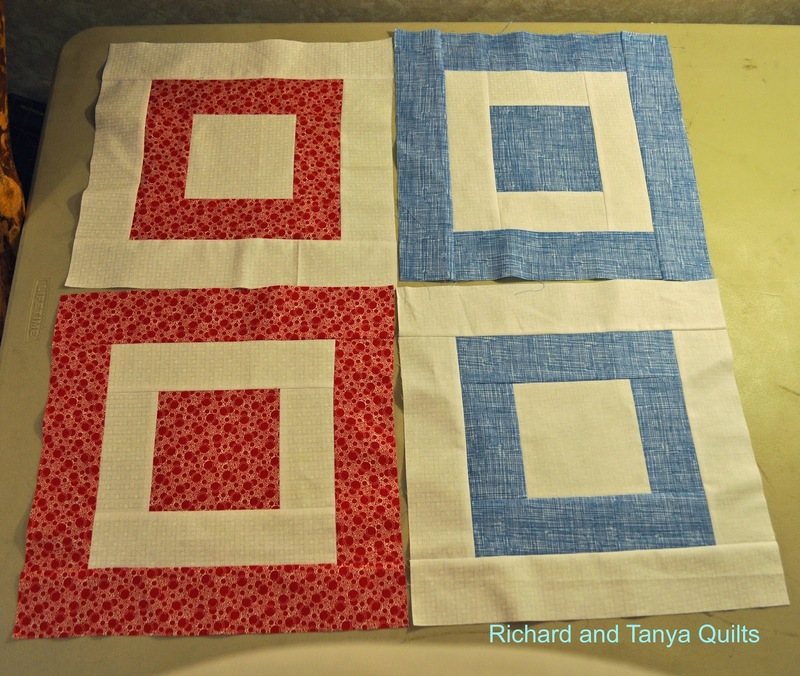 This should make a fun patriotic quilt and maybe a table runner or two. The mix at this guild is pretty good, some old, some young, mostly traditional with some modern. So far he is really liking it. 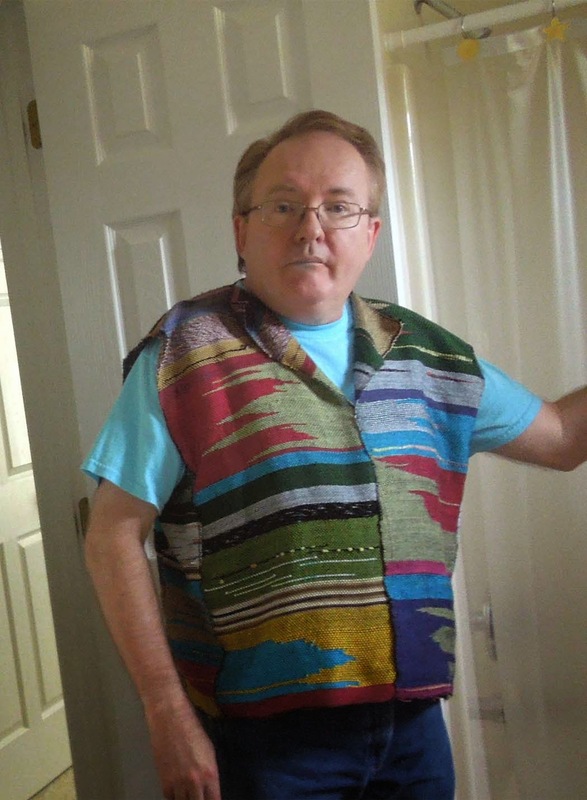 It is held at a quilt shop a few miles from his work. The past two weekends have been spent in Cedar City, Utah. We spend Father's Day with my (Tanya's) family. The following Sunday we went down, because my Dad had surgery and wasn't doing well. We were afraid we were going to be planning a funeral for this weekend, but he is slowly starting to make a little progress. He is starting to move his arms and legs and at least open his eyes. He still isn't doing great, but seems to making a little progress each day. At this point we are thinking he will at least make it. The trick is to get him better and then to start the fun of chemotherapy. It has been sitting on a desk to take picture of, but life has kind of got in the way. 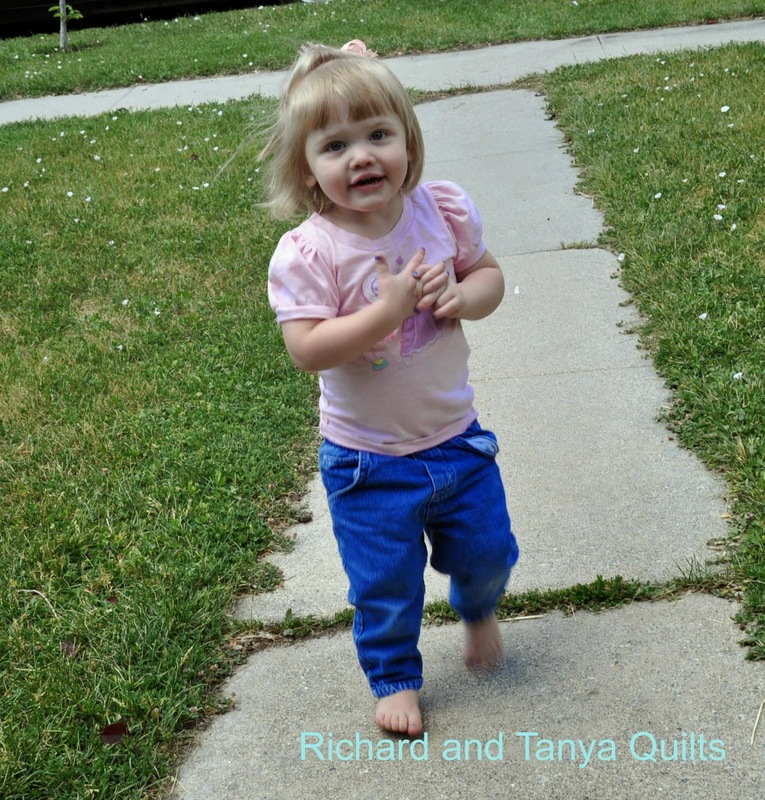 Richard's machine has been working great after it's trip to the Dr., just been too busy to sew much. 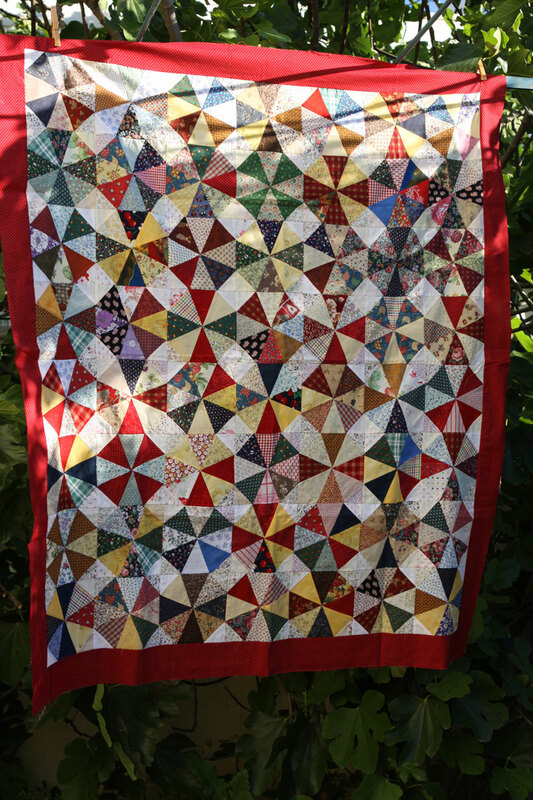 With any luck, Saturday we will get a little sewing done and some pictures taken to put some of our newer quilts on Etsy. This little one keeps us going when the world looks bleak. 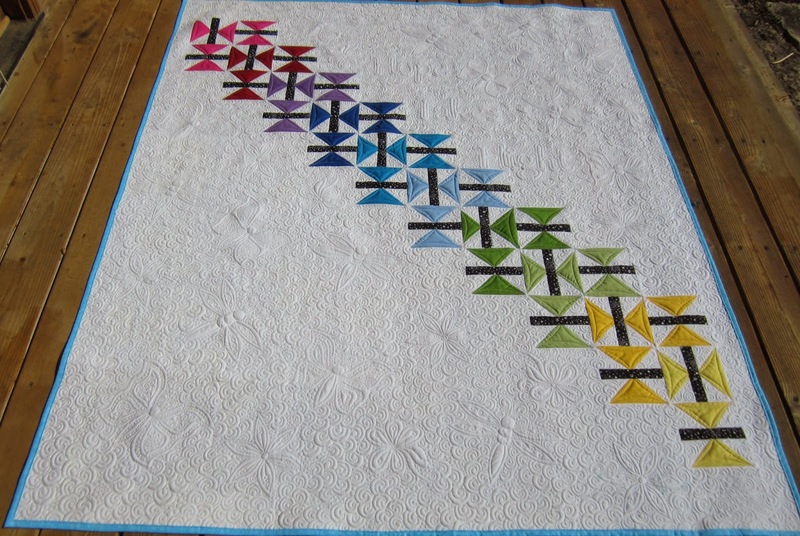 This quilt was finished weeks ago and I can't believe I am barely getting around to taking pictures of it and getting it posted. 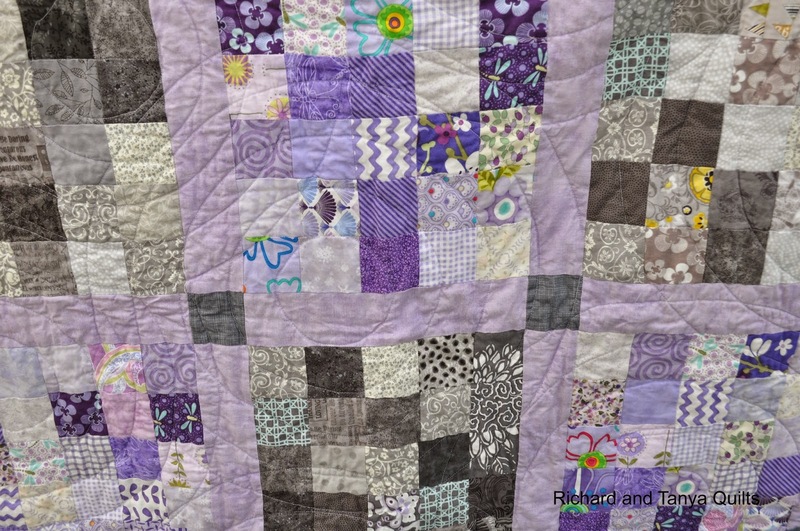 I went though a circle kick and decided to quilt giant circles across this quilt. 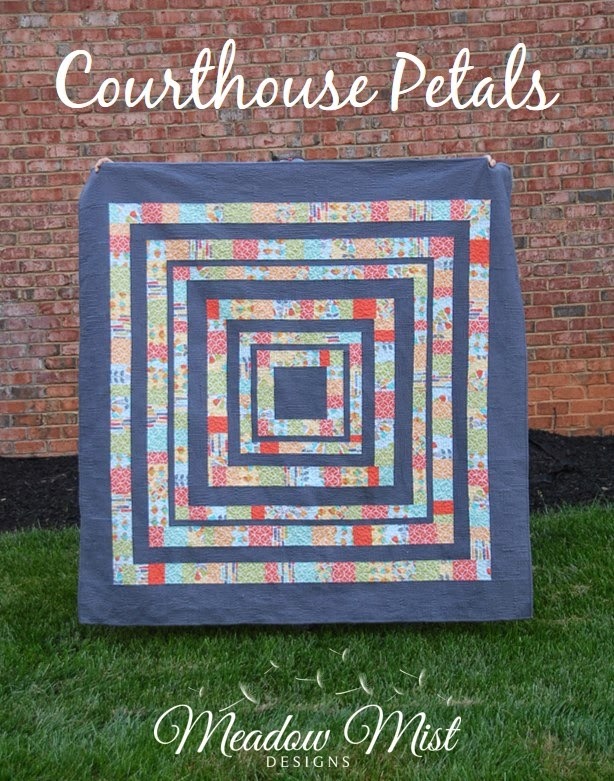 This quilt is made using my 25 Squared quilt pattern. I am a huge fan of chopping things up into tiny pieces and then putting them back together. 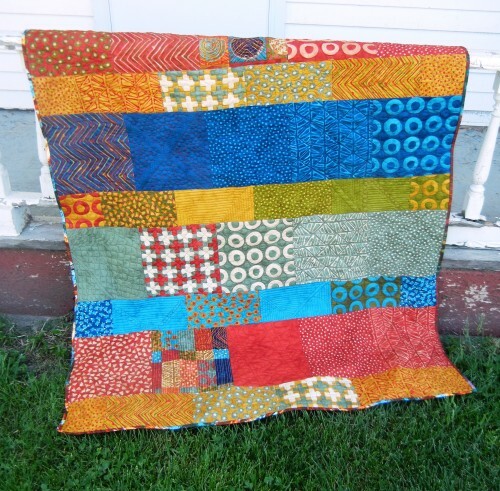 For those that have followed for a long time this is the same pattern that I made my all lap quilt out of orange and gray. 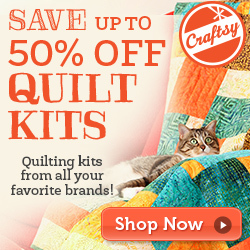 I wanted to do one for my bed in orange and gray, but Tanya vetoed it. 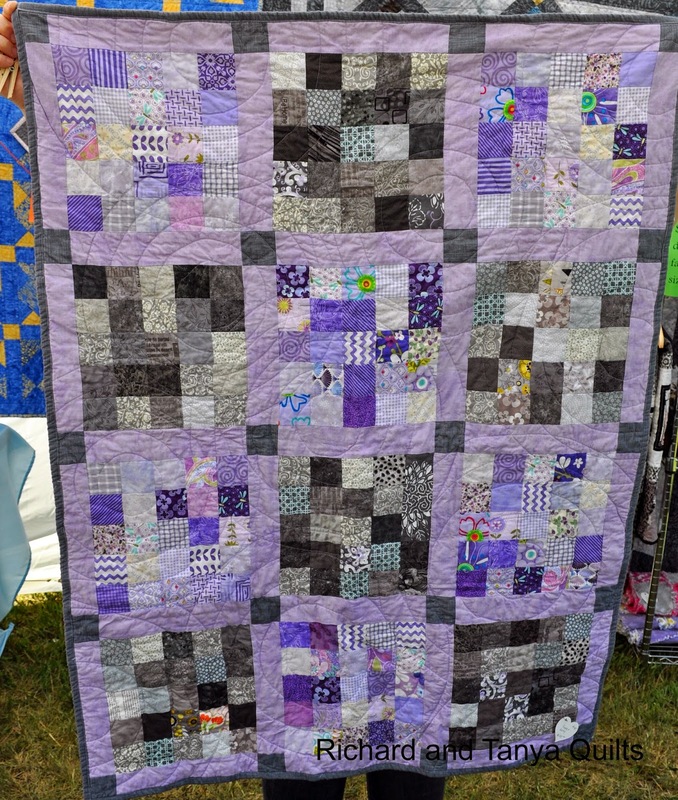 Lucky for me, she does not hate purple and gray and now I have a pretty quilt out of that. 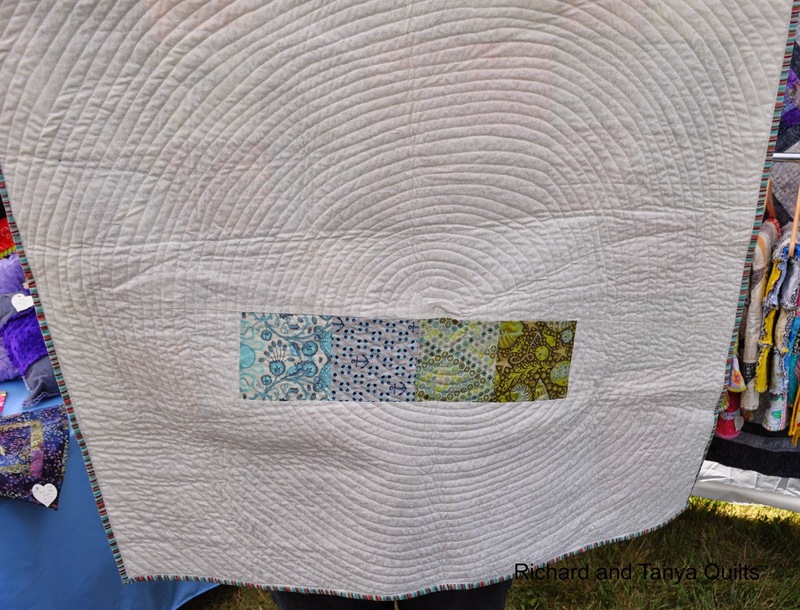 I love to piece my back, but for this quilt I used a fabric that had its own design it had gray dots (hence my decision to do circles) and they are dropping from both sides towards the middle. 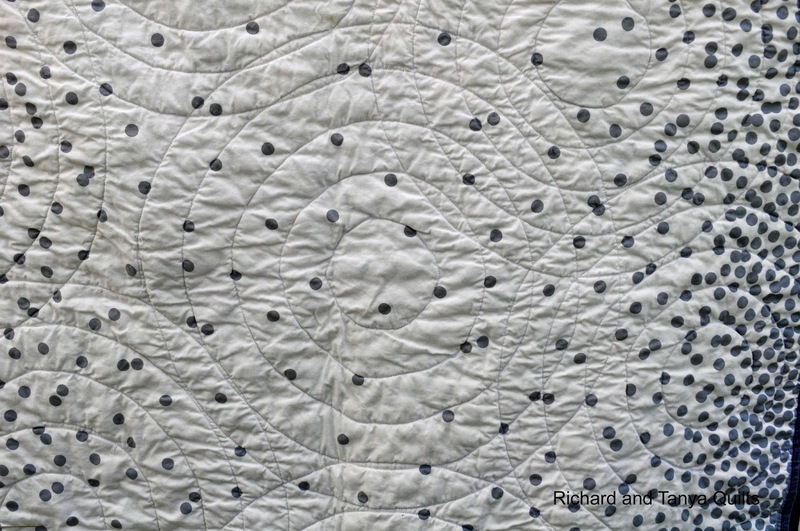 My circles that I quilted all over started at their center with a cup I found in the kitchen and then just echoed outwards using my quilting arm on my machine. After I got about 1/3 of the way done, I was tired of going round and round and remember why I don't do it a lot. 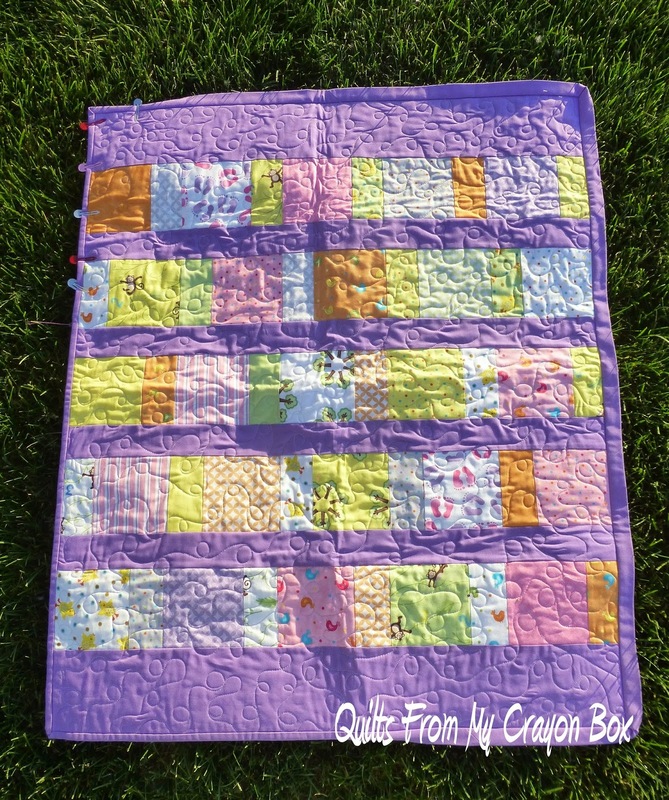 If you are interested in a free copy of this quilt pattern simply visit my pattern page on Craftsy and leave a nice comment their about the pattern and then come back here and leave me a message letting me know you did so. Make sure to leave your email. I have ran into a huge amount of people lately that are no reply bloggers making it hard to reply and give them their free patterns. 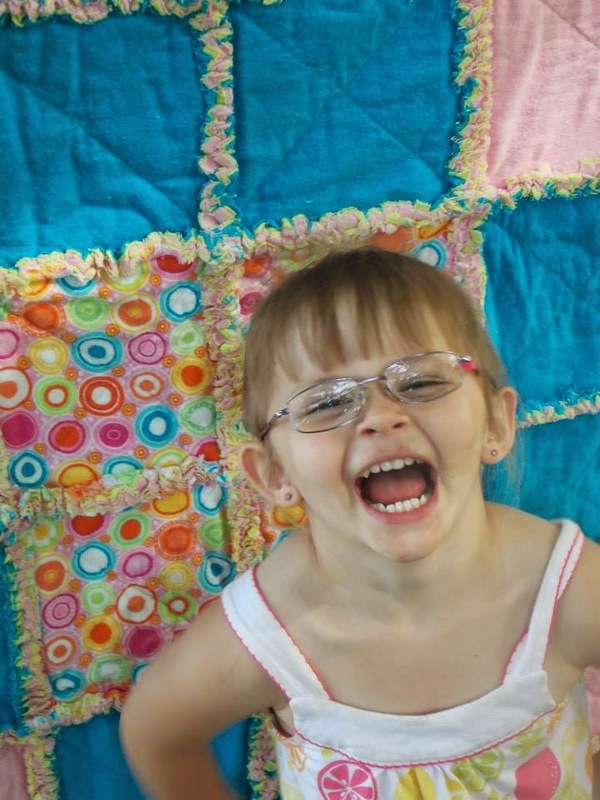 Melana bought my Rag Quilt Pattern on Craftsy and she has so far made 5 quilts each for one of her Grand Kids. She is still busy making a few more. 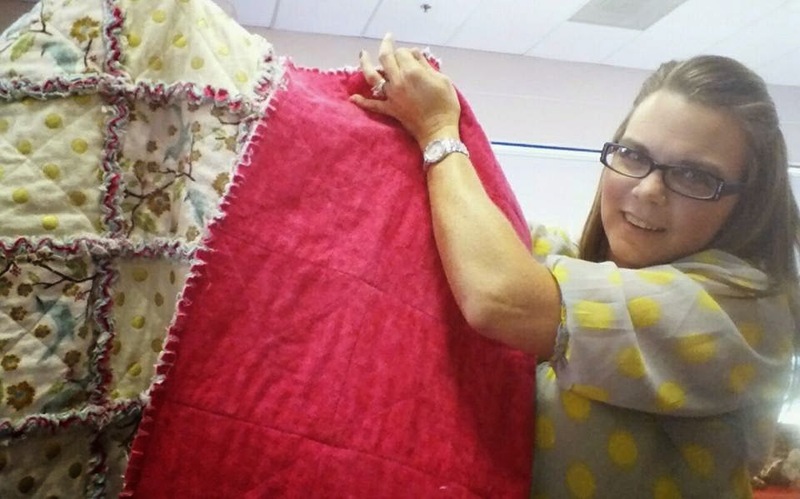 She has 12 Grand Kids, I cant wait to see there finished quilts. I love all the fantastic pictures and I am posting them with her permission. 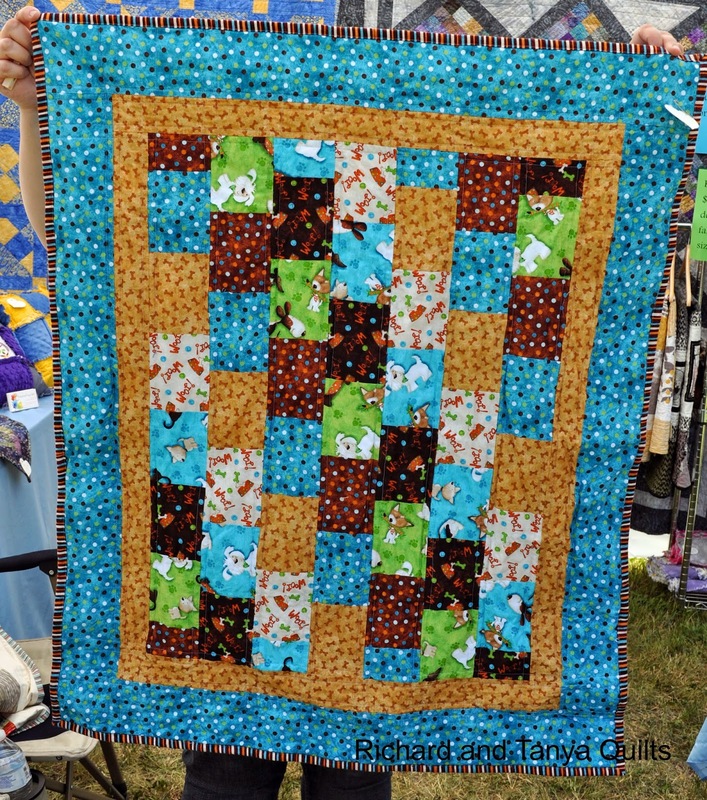 I think that her grand kids look pretty happy about their rag quilts what do you think? 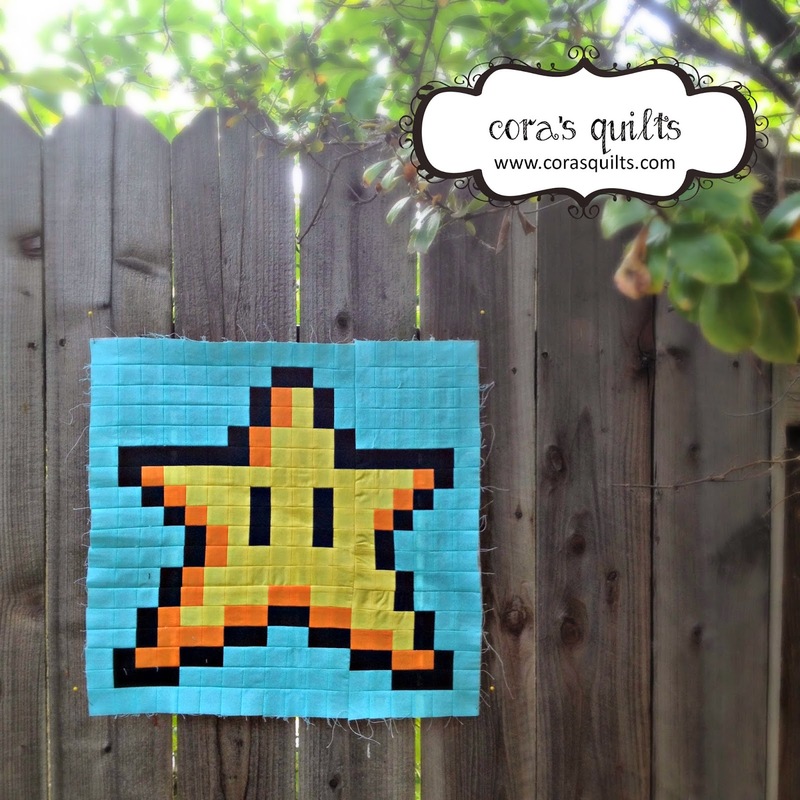 Baby Bricks is one of our patterns and one of my favorite. 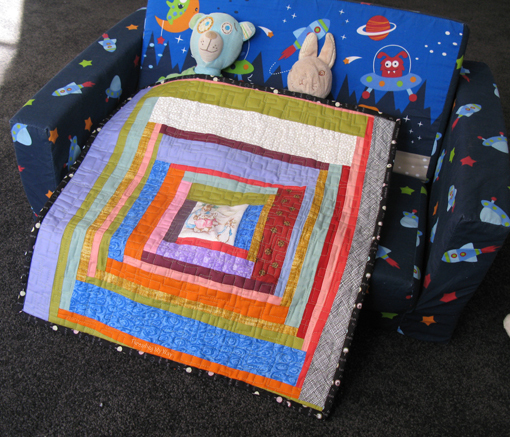 It is a fantastic looking baby quilt and we have made and will make many more in the future. I found this cute puppy fabric, while I was out looking for a completely different colored material. 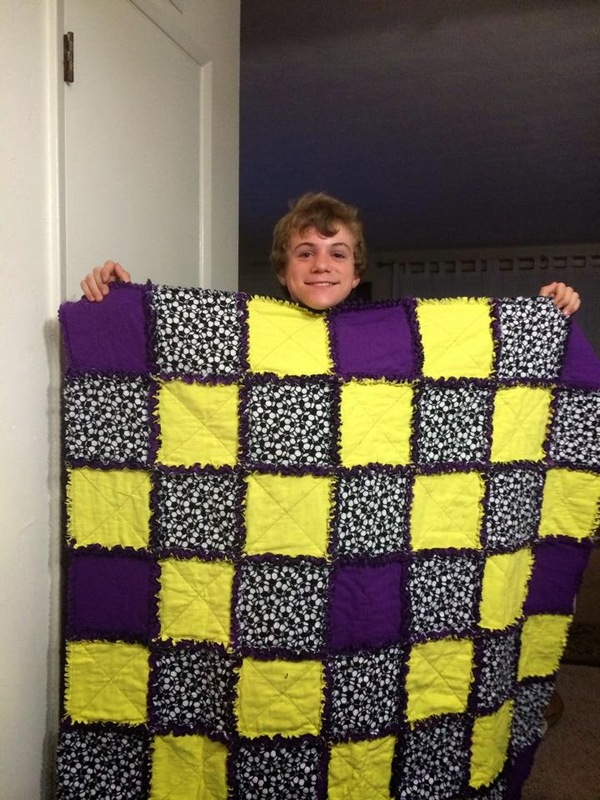 I had to buy it and had to make this quilt. 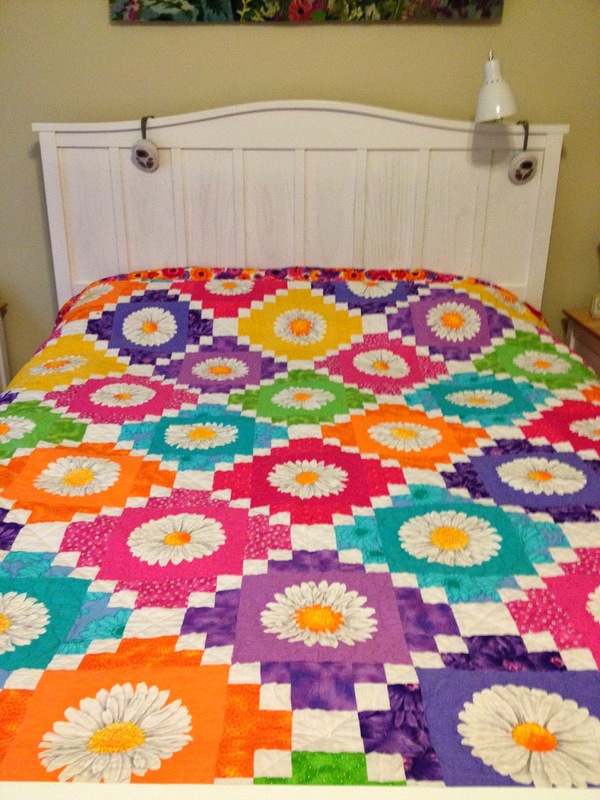 If you love this quilt you can buy it on our Etsy store and if your a quilter like me I will give the pattern free to any one that visits our pattern on Craftsy and leaves a nice comment and then comes back here leaving a comment so that I can send you the pattern. Make sure if you want a pattern to leave your email (I get many no reply bloggers that ask for patterns) so that I can get it too you. 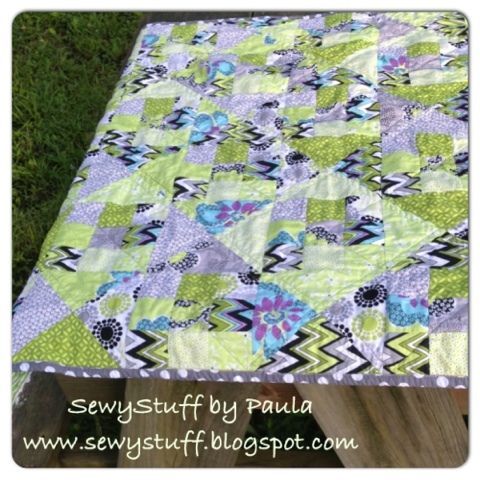 This quilt uses fabric from Salt Water by Tula Pink. 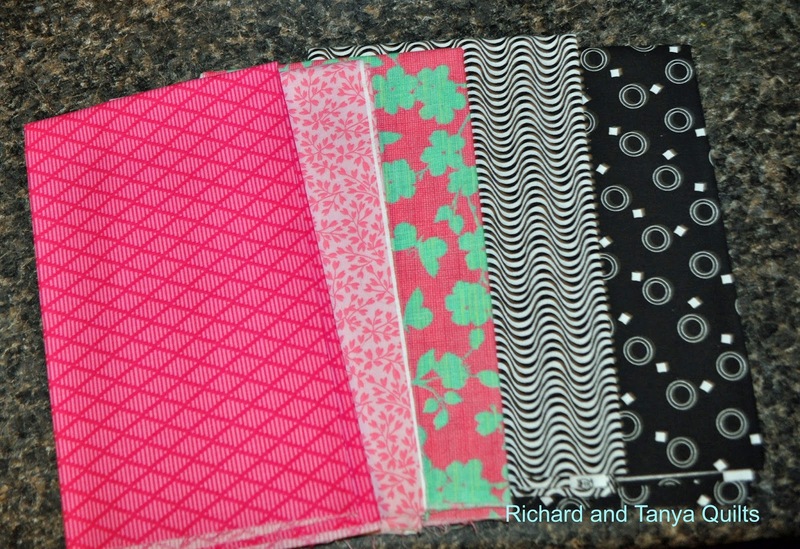 We won the charm packs in a giveaway last august from Leona's Quilting Adventure. Even the back off white has seashells to complete the ocean theme. 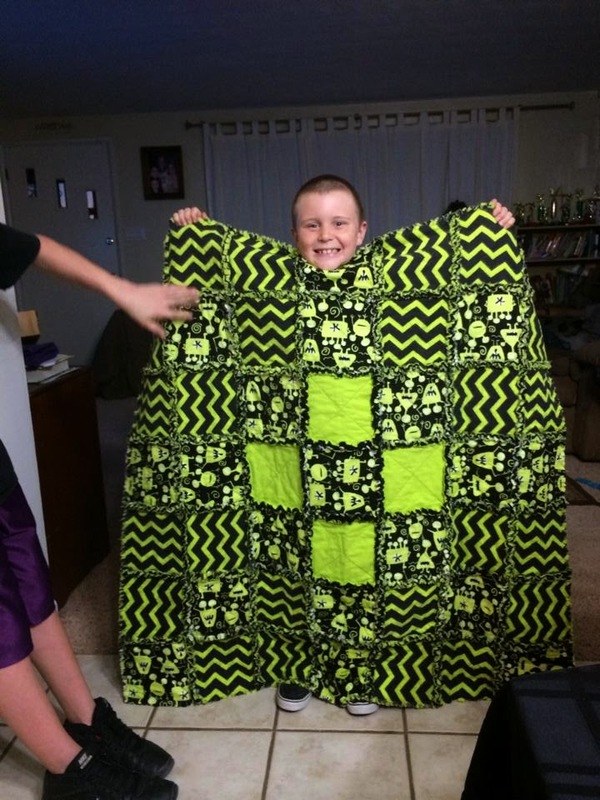 The pattern used in this quilt is our simple squares pattern (though the block sizes was bigger then the pattern its the same pattern). It worked out well for using these charm squares on. There were four leftover squares that got added to the back. The binding came from leftovers we used in a quilt for Julia. It was hard to tell it wasn't picked specifically for it. 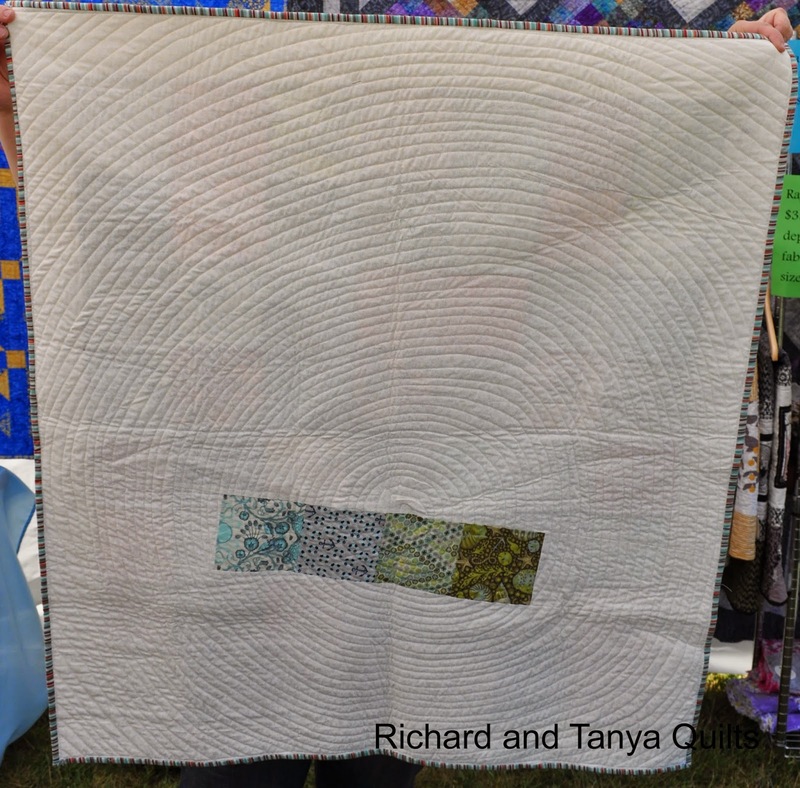 As you can see, it was quilted in circles. It reminds me of the ripple of water. 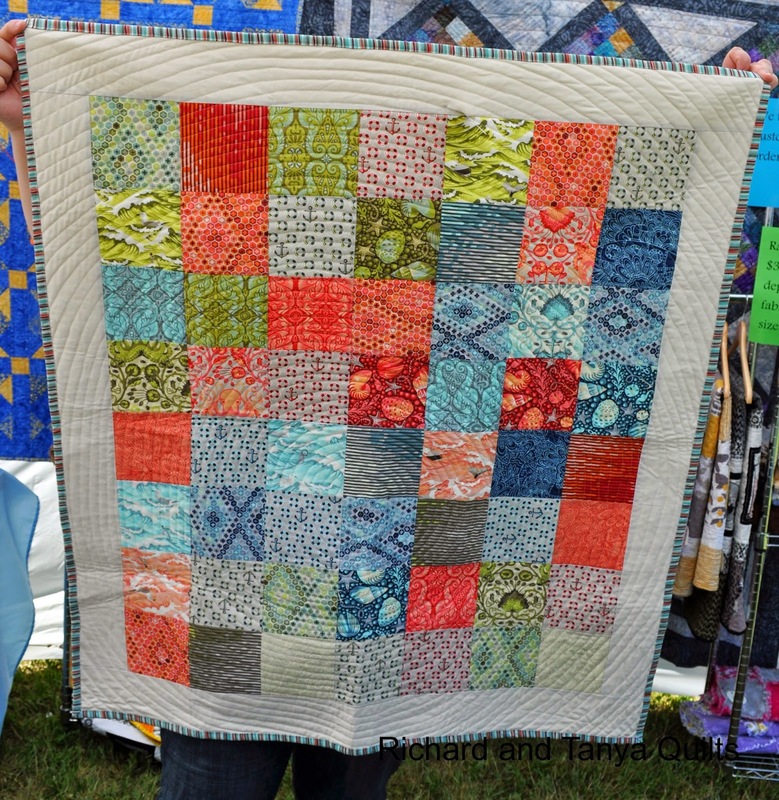 Tanya refers to this quilt as Sea Squares. 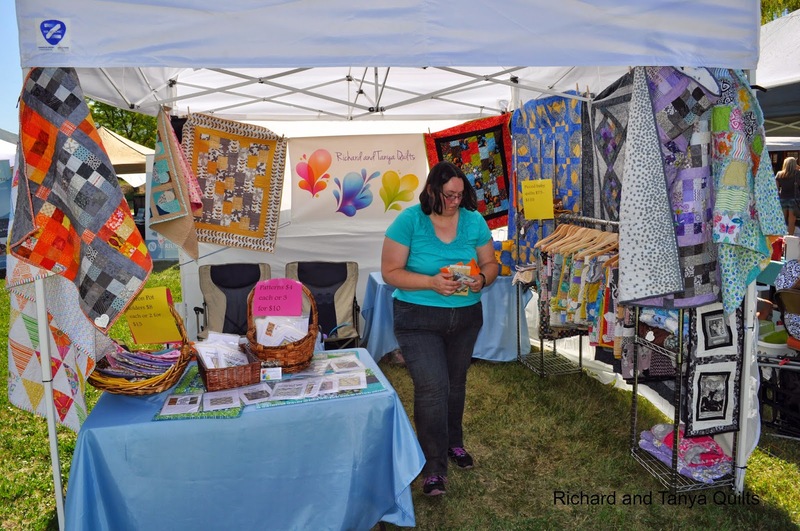 Craft Fair Successes and No Sales! Saturday we finally did it. What did we do? 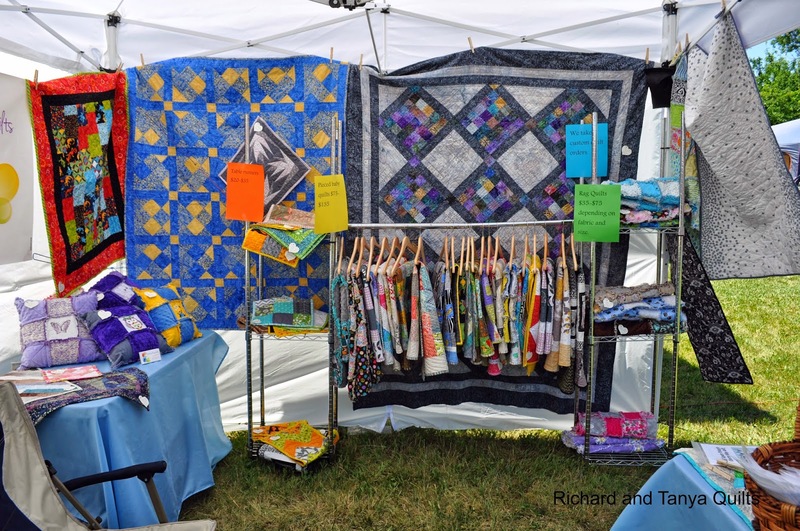 Oh ya, we attempted to sell some quilts by putting a both at a out door boutique that was held in Millcreek area, here in the Salt Lake Valley. As for the success, this is our first attempt to set up a booth and I think we did a fantastic job. 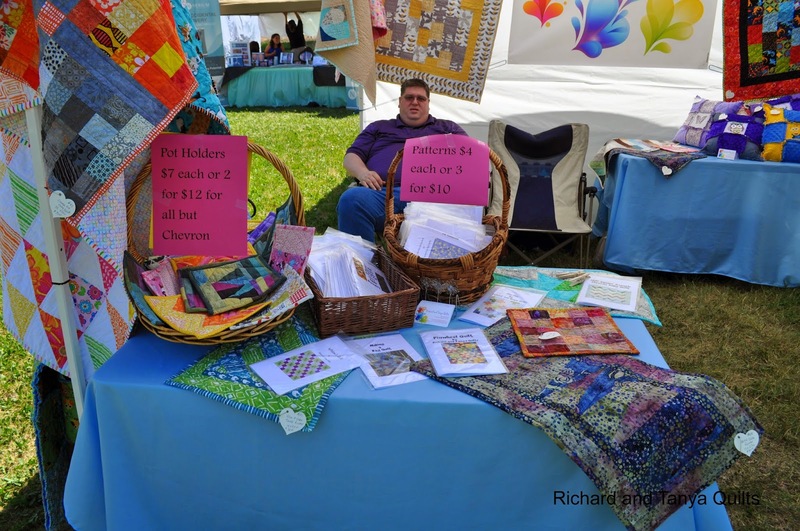 We had tables, quilts, patterns, and some chairs to sit in. What did we not have? Any customers! There were under 30 people who were not vendors there. Well it was not all was bad, I had a good chair and a good book. I would have been happier if there was any one that showed up to the Craft Fair. Its location was changed shortly before the scheduled date. Those that put this on, it was their first time putting one on. They tried hard, but the location mostly sucked and you can't help that. 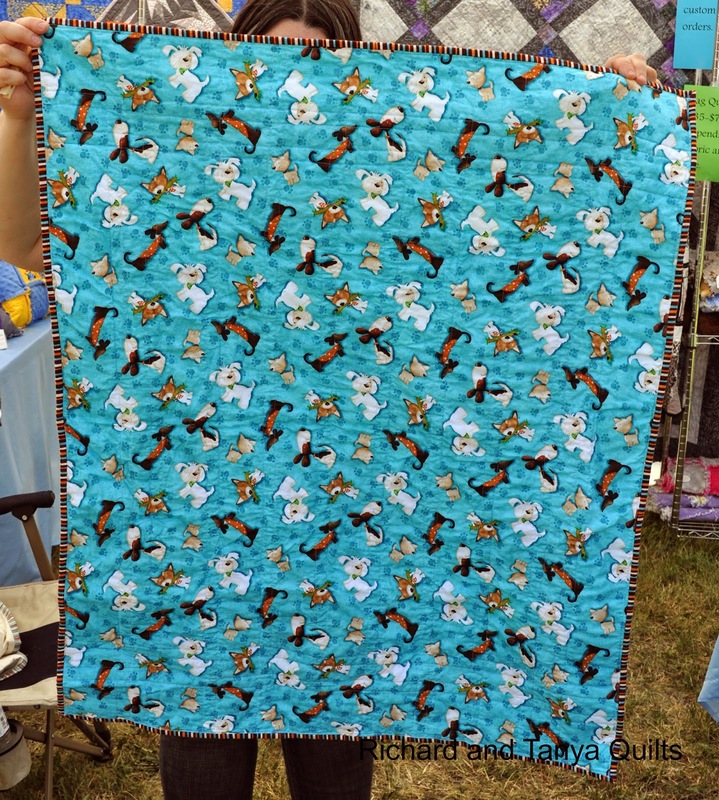 Have any of you done a craft fair before and either succeeded well or failed as bad? For any one that lives in the Salt Lake Valley in Utah this Saturday Tanya and I will have a booth at the Polkadots & Shiny Things Outdoor Boutique held Saturday June 7th from 10 am to 6 pm. If your able to come please do we would love to see you there 965 East 3370 South You can find more info at the link above. Hope to see you their. The last couple of weeks have been crazy, both good and bad. James (our 18 year old) has had his truck break down several times in the last few weeks, so we have been taking him to work each day. We got a new car for him today, yea, something that isn't almost as old as he is. The last few weeks of school are beyond crazy, bad and good. One kid done, another has 2 days left. Last week was my (Tanya's) birthday and I know, we never got around to a giveaway. We found out last week that my dad has Colon Cancer. We don't have a prognosis yet, still waiting on results. "Happy Birthday and by the way I have Cancer" are not two things you want to hear in the same call. Today, Jared turns 10. 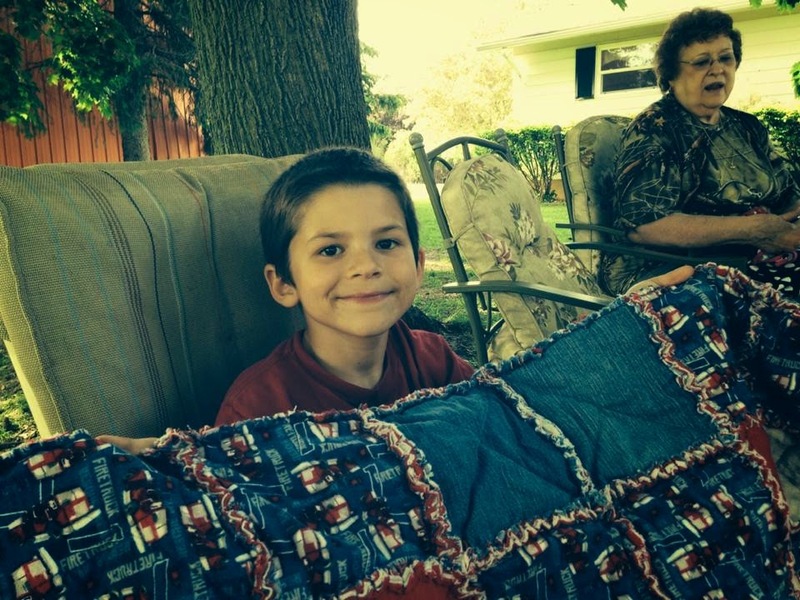 We are taking Jared and some of his friends from school to a movie to celebrate on Thursday. Seven kids, we don't know very well who are on the Autistic Spectrum should be fun, right? Wish us luck. On Saturday, we are participating in our first Craft Fair/Boutique. We have been trying to get everything ready for that, along with everything else that is happening around us. 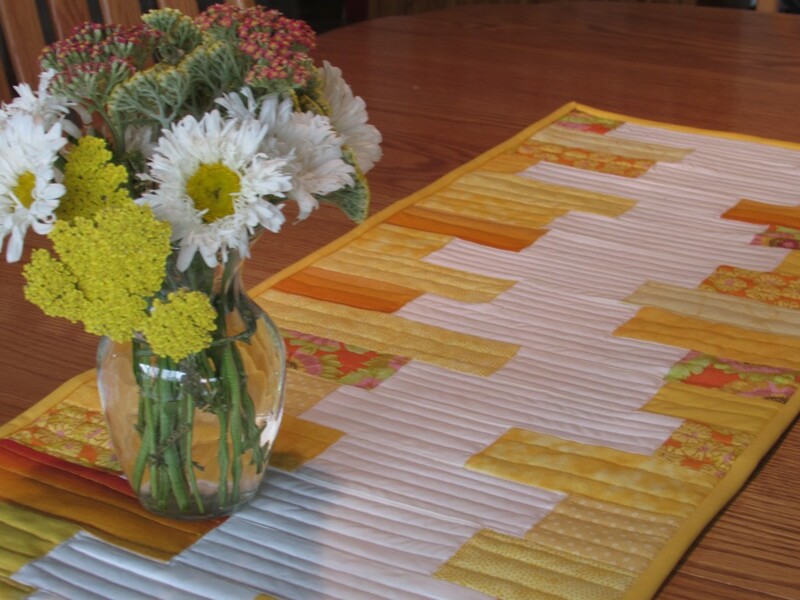 We have at least 3 quilts, lots of pot holders, a few table runners and some pillows that are waiting for pictures. Richard hates posts without a picture, so I added what our banner looks like. To add insult to injury, Richard's sewing machine was having major tension issues. It is in the shop, we don't know if it just needed a major cleaning and tuneup or if "Princess Trouble", ie Julia, adjusted it too much. He is currently back to using the same model of machine he started sewing on (Rebecca's Singer). 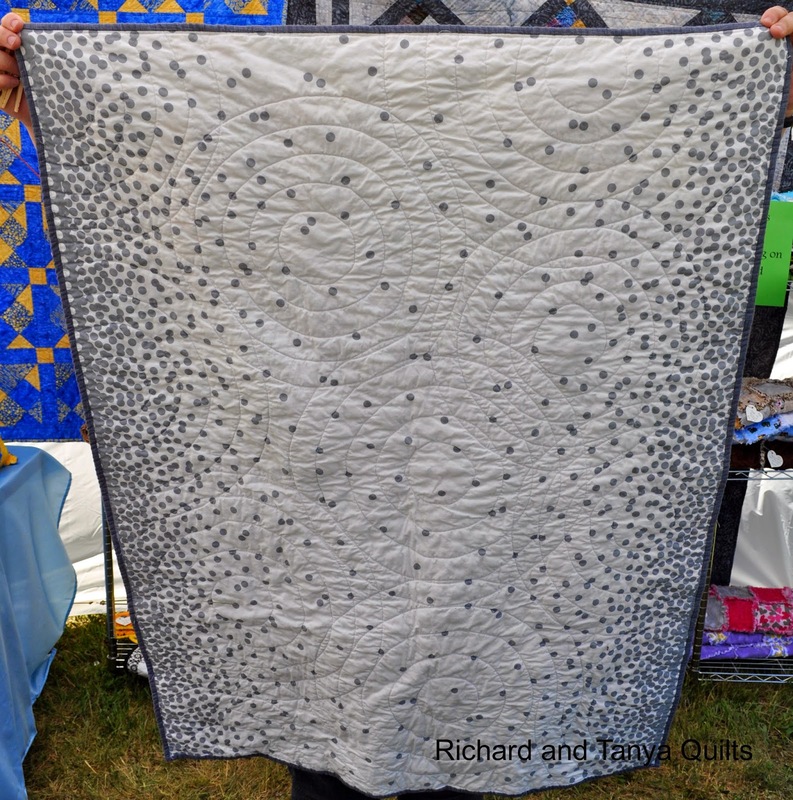 It is funny to hear him complain about how small the Singer is compared to his larger Janome He keeps wondering how he ever quilted anything bigger than a table runner on it in the past. If we survive Jared's birthday party and Craft fair, we will have a giveaway next week. Hopefully life will slow down a little and we can get pictures done soon and I can get some more sleep.